Given that Brussels is generally associated with rigid bureaucracy, it’s a pleasingly weird and surprising city where roads snake down into wide intersections like a surrealist European answer to San Francisco’s Nob Hill, bleak low-rent streets suddenly make way for gasp-inducing churches, and the smoking ban is casually flaunted, with polite good cheer, in restaurants and bars. The elegant Brigittines Chapel and adjacent modernist dance centre is an outcrop of elegance nestled alongside brutalist council estates and railway lines snaking their way towards the main station (Londoners, imagine the White Cube and Shoreditch Church plonked side-by-side in Bethnal Green). It’s a fitting setting for this live and club night organised by Meakusma, one of Belgium’s premier electronic music labels, as the way the artists on the bill seem to weave between styles and even musical epochs resembles the way old and new, classical and modern are reflected in the neighbourhood’s architecture. Thomas Köner opens proceedings with a set that is characteristically austere and foreboding, close in style and atmosphere to his recent, excellent Novaya Zemlya album. Standing stock-still in pitch darkness behind his laptop, Köner is a picture of stoic efficiency, and his music has a similar immovability. Huge, cavernous drones and bass lines ring around the rafters of the chapel, punctuated by clanging industrial noises and occasional becalmed, almost reflective passages. The music’s mental imagery will be familiar to any fans of the former Porter Ricks man: ice-covered landscapes and isolated Arctic settlements, all considered with a detached, yet humane, gaze. It’s an often beautiful sound and, although it at times feels more inert and unfocused in a live format than on record, Köner‘s sturdy, steely focus (heightened here by the darkness) is remarkable. The name Wolfgang Voigt will be instantly familiar to anyone with an interest in German electronica, as he co-runs the always-excellent Kompakt label and has, in various guises, released some of the defining records on both his own and others’ imprints. Mohn is a new project with Jörg Burger, and feels in some ways like a continuation of Thomas Köner’s glacial drone, albeit with more edge. Like their compatriot, the pair stands in almost complete stillness and darkness, but there’s the added interest of a series of hazy, often slow motion, visuals projected against the back of the hall behind them. With the old chapel’s exposed stones providing an uneven surface, this footage becomes more esoteric and cryptic, like scenes played out in a thick fog. Mohn’s music is equally fuzzy around the edges, as if Voigt and Burger are unsure of where to place it in electronic music’s already-elastic continuum. More beat-oriented than Köner, they nonetheless share his taste for drifting synth textures and industrial noise, the result being a hybrid form of gothic, futuristic techno-house. Occasionally, it veers into the kind of post-muzak you’d expect to hear in a designer clothes’ store, but for the most part this is electronica descended from the murky haze of Throbbing Gristle’s ‘After Cease To Exist’, but with more rhythm. The balance isn’t always smooth, but it certainly makes Mohn an intriguing proposition. Tonight, though, is all about the club night, where I am treated to some of the best electronic music I’ve ever heard. Barnt, aka Daniel Ansorge, is best known as one of the founders of Magazine Records, and his excellent DJ set treats us to an array of throbbing fare, from cosmic disco pounders to minimal hypno-trance. In a pleasingly referential nod, one of the tracks he plays, a friend informs me, is by Wolfgang Voigt. Recyclart is a wonderful club situated over the road from Brigittines inside an active train station (closed on weekends), its walls covered in graffiti. Again, the parallel between location and the sounds pouring off the decks is easy to make. The biggest draw of the night is, unsurprisingly, Damo Suzuki performing with Groupshow, a trio of Jan Jelinek, Hanno Leichtmann and Andrew Pekler, who set themselves up in a semicircle, with the former Can vocalist sitting off to one side, all the better to bark his lyrics at the audience (although he does generally seem to be singing to himself). Suzuki is one of the most inimitable, instantly recognisable vocalists ever, and his voice has barely been affected by the passing of time. In fact, he sounds more virulent and arch than ever before, hurling his stream-of-consciousness invectives out onto the dancefloor like a possessed shaman, in a style reminiscent of his recent album with Bo Ningen. Groupshow, meanwhile, combine throbbing bass with motorik, krautrockian rhythm patterns and washes of moody synth and guitar drones, resulting in a disjointed post-everything form of electronica that sits somewhere between Neu!’s loping rock and the more electronic fare on show from the other acts. It’s by far the most experimental set of the entire night, and I for one am digging this angry version of Damo Suzuki. By now we’re well and truly into the the wee hours of the morning and a party atmosphere has gripped Recyclart as MM/KM take over for some live house. Repetitive beats flow fast and furious over gorgeous melodic lines and funky bass, all the more impressive for being live. The amiable Belgian crowd relays its appreciation by roaring approval at every tempo shift and shaking the floor as they dance, some of them in bizarre choreographies improvised on the spot. Again I’m left to marvel at the sheer depth and variety of Germany’s electronic scene, as the legacy of early techno is propelled through three decades’ worth of hooks, sounds and omnipresent rhythm. 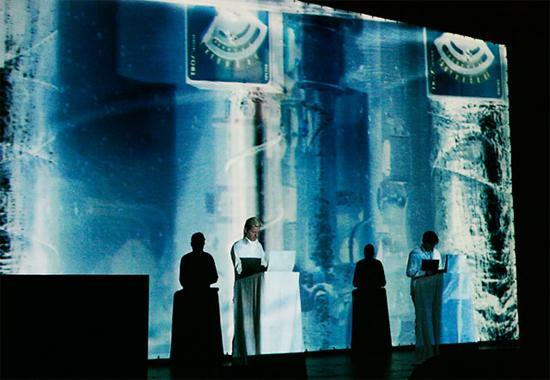 This is minimalist techno at its best, and Germany’s ambassadors are doing her proud tonight. As the clock strikes 3am, it’s left to Anthony ‘Shake’ Shakir to round things off with a joyful bang as he injects a bit of Detroit soul and funk into proceedings in a barnstorming DJ set, which includes a tasty Talking Heads sample that elevates one segment to anthemic levels. As I’m vomited out of Recyclart and back onto the freezing streets of this obscure corner of Europe’s capital, I’m reminded of dance music’s capacity to be an entirely transformative and transportative experience in the right hands. This entry was posted in 2013, Concerts, The Quietus and tagged Damo Suzuki, drone, electronic, experimental, improv, Industrial, Kompakt, krautrock, Meakusma, techno, The Quietus. Bookmark the permalink.